Anthony Soto and Lisa Wong. HOLYOKE — He noticed her all along. Who didn’t? Lisa Wong is a rising political star, the turnaround artist in Fitchburg, the first Asian-American mayor in the Bay State. Beautiful and wicked smart, she had spearheaded the economic revival of her shattered mill town. And she was on the dance floor. Yet, she wasn’t dancing. She was doing what she does best, networking and connecting with other young female political aspirants at the Democratic National Convention in Charlotte, N.C., and collecting their business cards. A few of the women wanted to know more about Anthony Soto, the Puerto Rican city councilor from Holyoke who — along with Wong — was among the Massachusetts delegates at the convention. Afterwards, Wong approached Soto, proud of the cards she had collected and told him of the women who had expressed interest in him. Soto took the cards and ripped them to pieces. He only wanted to be with Wong. Fitchburg Mayor Lisa Wong and her husband, Holyoke Councilor Anthony Soto, are not the only New England politicians married to politicians. And so began the Massachusetts romance between the mayor and the city councilor, a long-distance affair sealed over campaign functions, glad-handing, and community dinners. As they traveled between two cities — an hour-and-a-half drive apart — over the next three years, they grew closer. He was her plus one. And everyone took notice. When they got married in November, some of their supporters dreaded what they would do next. Would she leave her beloved Fitchburg? Would he ditch his hometown of Holyoke? Indeed, Wong will not seek a fifth term. She is leaving Fitchburg in good economic standing to join Soto in his own history-making campaign to unseat Alex B. Morse, Holyoke’s 26-year-old mayor. 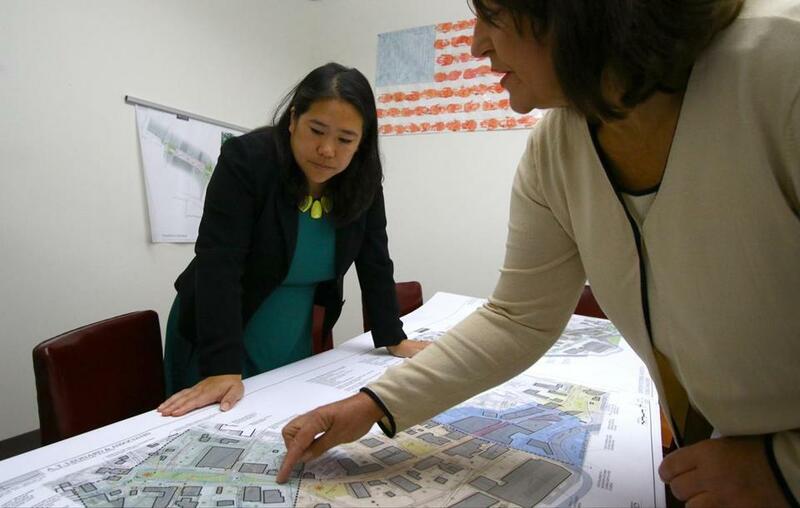 Economic development director, Mary Jo Bohart, (right) and Fitchburg Mayor Lisa Wong, went over city planning prints. She’s an uptown gal and he’s a downtown guy — that’s how Wong describes them. She’s a serious person — a policy wonk, whose days are scheduled down to the minute. He’s easygoing, jokes with guests. She had three degrees at age 20. He is still working on his bachelor’s degree from University of Massachusetts Amherst. Yet they connected. Unlike his previous dates, she would light up political functions where lawmakers tediously thank every other politician in the room. When there’s a crowd at one of these events, he’d take hold of one group, she another. On the way to a date one evening, she didn’t mind hopping out of his SUV to help him pick up trash from a sidewalk. And he didn’t mind her smartphone buzzing at all hours with all matters concerning Fitchburg. Even the evening he proposed, she came home late reeking after tending to a sewer spill. He gave her the ring. He gets it. She gets it. And together they found themselves in the same space, getting excited about their communities, helping to uplift people, sharing a passion for things like arts and crafts houses and animals. Wong, 36, was a high school valedictorian who went on to earn three degrees from Boston University, run an economic empowerment group for women, and win the historic mayoral election by the time she was 27. The daughter of Chinese immigrants, she grew up in North Andover, one of three children in a quiet family. She came to Fitchburg around 2001 to lead the Fitchburg Redevelopment Authority. Fitchburg, a city of 40,000, was on the edge of financial ruin when she started as mayor and took some unpopular stances. She shut off street lights to save money, trimmed hours at the library, steadied the troubled school system. Wong teamed with Fitchburg State University, turned the river into a scene for revival, and transformed a blighted downtown into a launchpad for small businesses. Four people are on the ballot to replace her. It hasn’t been easy. In Wong’s campaign for a third term in 2011, some wondered whether she was losing favor, and her victory was seen as a major comeback. That year, Wong was at a birthday party bash for a friend at the Wherehouse?, a popular functional hall in Holyoke. Soto saw her in the distance, with a crowd forming around her. “People were saying, ‘Oh, there’s the mayor of Framingham,’ ” he recalled, laughing. He mustered the courage, parting the flock around her, and introduced himself. She was busy networking, and the moment did not register for her. It was their first meeting, before the DNC party. 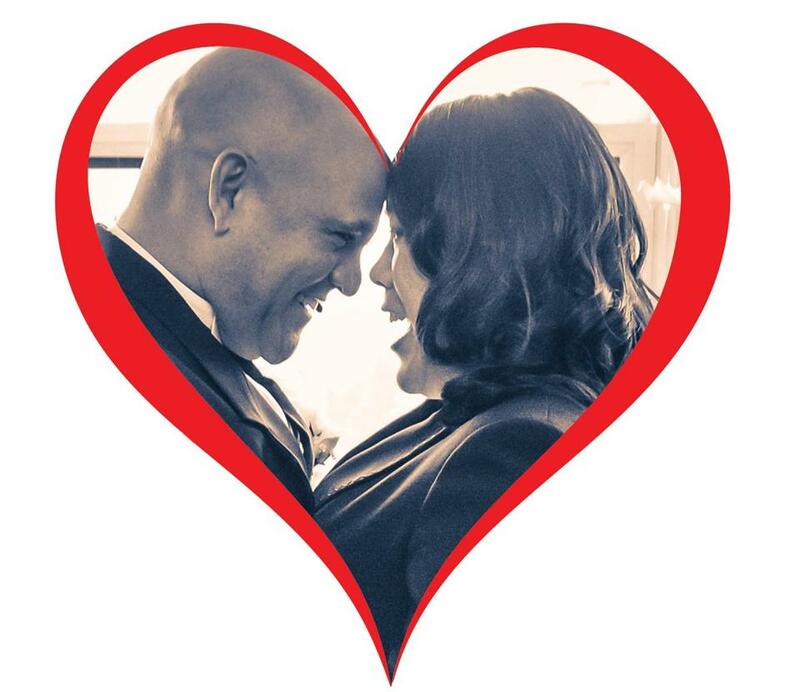 Last fall, they got married in a small ceremony at her brother’s apartment in Kenmore Square. He wore a vest and dark suit, she wore a strapless white dress. Family surrounded them. It was the first marriage for both. In photographs, they appear blissful, framed by a curtain of white origami cranes. 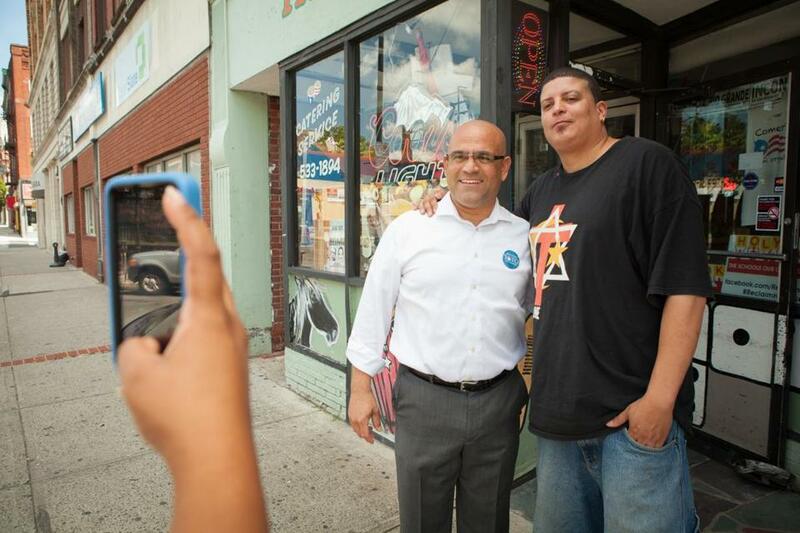 Holyoke City Councilor Anthony Soto (left) posed for a photo with supporter Edwin Santos. Soto, 42, is from a large Puerto Rican family whose home sits among the hard edges of Holyoke. His grandparents were among the first Puerto Rican families to set root there. Hispanics — including a growing Puerto Rican community — make up nearly half of Holyoke’s 40,000 population, according to the 2010 Census. After becoming a father at age 19, Soto took a job cleaning toilets at a housing development to make ends meet. Several years later, he became a case worker at a juvenile detention center serving teenage offenders. He also began doing voter registration drives, catching the attention of an aide in the office of Secretary of State William Galvin, who hired him as a field representative in Western Massachusetts. He’s been at that job for the past 14 years. He has four children — ages 18 to 23. Two are in the Marines. At 38, Soto became a city councilor for the first time. Now he intends to lead Holyoke, a beleaguered city battered by rising crime and a public school system currently under state control. Ward 2, the city’s gritty quarters, has sent Soto to the council for two consecutive terms. Soto said he believes he can turn Holyoke around. He said he doesn’t have all the answers and will build a team to bring about that change. Only three candidates are competing to unseat Hoyloke’s mayor, including businessman Francis P. O’Connell. If he wins, Soto would be Holyoke’s first Hispanic mayor, but he said he’s not running to make history. He is aiming to build trust among residents who have lost their faith in their political leadership. For Wong, deciding to leave Fitchburg wasn’t easy. But she said after reading up on the poor state of the Holyoke’s public schools, she knew she could have an impact there either as a parent or resident. After four, two-year terms, she will miss her city, her godchildren, her friends, her stamp on the city’s redemption. But she is ready for Holyoke and her new life. Peter N. Ubertaccio, a political scientist at Stonehill College, said don’t count Wong out of Massachusetts politics just yet. While “it fits the trend’’ of professional women leaving their jobs in favor of their families, Wong could return to political life soon, he said. The professor said that in Massachusetts many elected officials are stymied not by gender but by a lack of opportunity to get to higher offices. With so many political seats held by Democrats, there simply isn’t room to grow, he said. For now, Wong said she’s happy. When they were dating, they would steal time together. Both had to keep their homes in their respective cities until they stepped down. That will soon be over. She’s learning to relax more. He’s better at planning. Instead of colliding, their worlds are fusing. They are talking about downsizing their belongings, and which couch fits better in the Holyoke living room. For now, everything else is fitting just right.